From August 3rd to 12th the city of Medellin in Columbia comes alive during the Feria de Las Flores, the Flower Festival. 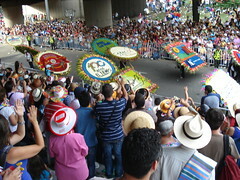 The festival’s most compelling event is the annual Desfilo de Silleteros parade that features local “silleteros” who carry colossal flower arrangements on wooden pallets on their backs. The most beautiful arrangements win an award. The festival honors silleteros who 200 years ago walked barefoot throughout the city carrying sick people on wooden seats on their backs. Later the silleteros carried flowers and other goods on these wooden pallets to sell in the markets. Several other events take place all week, such as concerts, exhibits, and performances. Find out more about the festival here and more about the rich history here.